The Roland BK-7m is a professional, portable backing module for solo musicians, pro entertainers and anyone requiring flexible accompaniment from a variety of sources. The BK-7m is literally packed with top quality tones, styles and rhythms with one-touch access. Play smf, wav and mp3 files directly from USB and record performances directly to USB memory. Use the BK-7m as a top class sound module to use with the MIDI output of your keyboard, V-Accordion or other MIDI controller. If you're a solo performer in a professional cntext then the BK-7m is a great partner to make your performances shine. Whether you're using it for playback of backing tracks, as a sound module, or indeed both, this module has you covered. If you need a reminder of lyrics and chords, or for a spot of karaoke, the Roland BK-7m is also capable of displaying lyrics on external monitors for reference. 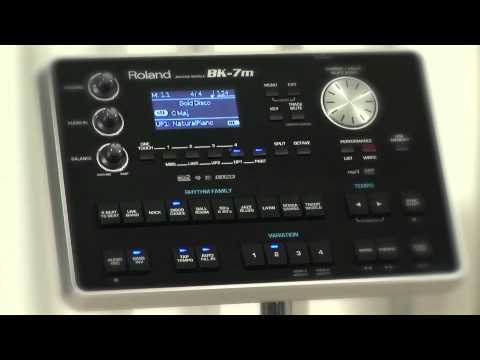 While there are computers and various modules available for this purpose, the Roland BK-7m offers incredible professionalism, world class sounds, incredible flexibility, fast operation and a very small stage footprint. The portability and the simple setup make this device a huge time saver too, which is extremely helpful in an industry that involves quick changeovers and keeping 'dead air' to a minimum. Weight 1.7 kg/ 3 lbs. 12 oz.